I just wanted to take a minute to thank you for the work you did on our roof. You came up with a good plan to fix the leaking skylights and did a lot of follow up to ensure that we are no longer having issues - that is virtually unheard of in the Memphis area these days! As you know, our home is a little older and has needed some repairs done as of late. I have hired several companies to do various repairs, and none of them did the quality of work you did, let alone did any follow up after the work was completed. Your price was fair, you came when you said you would, and you did the work you described without taking any shortcuts! Thanks again to you and the guys - I know you will continue to do well with your business as your work and your word speak for themselves! I am writing to express my appreciation for the work you recently did on our home. The quality of work was excellent and I am especially pleased with the fact that not only was everything done right, just as importantly, you kept your appointments and finished everything you started quickly with no disruption of our daily lives. Many contractors today are quick to start a job and get you committed, but then its like pulling teeth to get them back to get everything finished. Thank you again for you efforts and please feel free to use us as a reference. We will certainly call you first if we need any work done in the future. This is a very strong letter of recommendation for Mr. Ronnie Hill of Hill Contracting. 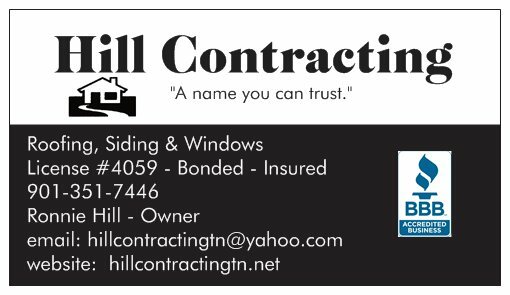 Mr. Hill performed various periodic maintenance tasks on my home including siding repair, cabinet work and other jobs. He was positive, enthusiastic, and his work in all areas is of the highest quality. Mr. Hill does things right even if that means a little more time is involved on his part. He was always on time, did the work for his estimated price, and worked well with me when we made any necessary adjustments. Mr. Hill is very customer oriented and readily made suggestions that improved the look of what I wanted done at no additional cost. I'd recommend him to anyone and I intend to hire him again when I need anything else done on my home. My experience with Mr. Hill was the best I've every had with any home repair professional. Since the day my new skylight was put in it has leaked. The company that put it in came back 4 times in the next two years. Then stopped taking my phone calls. I had other roofers come out and try to fix it but everyone wanted to just try and patch the problem instead of fixing it. Ronnie Hill came out and told me that he would pull the old skylight and flash and shingle and would make sure it wouldn't leak. I got 3 bids to do the same and his was the most reasonable. He came out when he said he would and did the repairs. After he did the repairs, it rained hard for 3 days straight and not a drop of water came through. He even came back a few weeks later and re-blew the ceiling for me at a very reasonable price. Ronnie is a very knowledgeable contractor and does very good work. I recommend him to everyone I know and that is in need of work done on their home. I'm really happy with the new roof. Thank You! We are very pleased with our new roof and trim. You and your crew did an excellent job overall. Your attention to detail and dedication to doing everything right was impressive. We would not hesitate to recommend Hill Contracting to anyone seeking excellent work at a fair and reasonable price. Thanks for the service. I appreciate your thoroughness. I definitely will recommend you to others.